Beautiful color. I love all the stone work. and keep the display looking fresh? Gorgeous. I love it !! 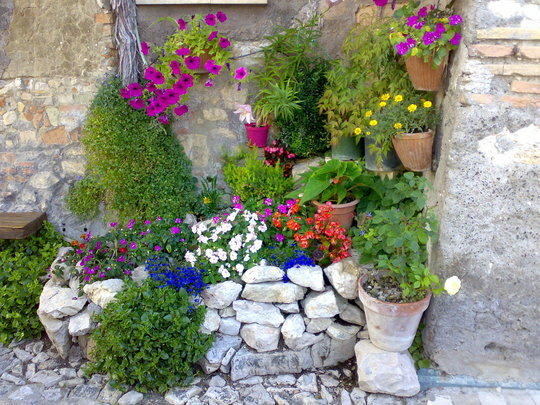 Oh this is just lovely; gives me an idea of improving my rock garden. Thanks Gardengnome for all your comments - much appreciated. So Pretty! How did I miss this one? this is just beautiful, I could look at it for ages. It's amazing what you can do with a limited space. Brilliant! How about some calceolaria? I was looking at this picture and I was thinking that calceolaria is such bright colours that it would really cook with your begonias, and petunias...! If you hadn't commented on Hywel's picture of nearly a year later than this one, I wouldn't have had the pleasure of seeing this ! Not yet, anyway. Let's see whose comment I like the most : well many are good, I'll choose say Jo art's. I can't say more than that ! I do like this idea of arriving on the scene a year later : it gives me a sort of bird's eye view of all the action ! Well Gurthbruins you'll soon be able to see what it's going to be like this year - it's never the same from one year to the next ! !